I love a good casual dress for summertime: it’s easy to throw on and super breezy, but a lot more put-together than the typical t-shirt and denim cutoffs combination we see so often in laid-back Vancouver. I’ve been living in some variation of this outfit for days of shopping and walking this summer; it’s not only super comfortable, but an easy dress makes it that much simpler to try clothes on, too! Such a pretty dress! I love that bright orange pop! bag is a great contrast. Definitely one of my favorite looks you’ve been wearing lately! That dress is great one you! This is such a beautiful print for a dress! Aritzia never disappoints! Oh my my, that dress is absolutely fabulous on you! I love your Michael Kors bag, too! Every time I see you wear this dress, I kick myself for not buying it – my main hesitation was that it might not be versatile enough, but you’ve styled it so many different ways that I know for sure I was mistaken. I love this incarnation with that fabulous orange bag, which is without a doubt my favourite piece in your arsenal of accessories 🙂 You’re looking lovely as always, Jen. Hope that you and David are both well. Gorgeous dress and nice pairing with that bright orange bag! I also love dresses for summer laid back days, it’s just so ‘uncomplicated’! You’re looking very cute! Great bag & sandals… lovely smile! I love a great summer dress too; wearing one piece of clothing that instantly makes you look put together is always a plus! The colours of the dress are beautifully brought out by your accessories. Still a fan of your orange bag and the gold Coach sandals are perfect! I enjoyed browsing in your blog, I ♥ your style. I’m following your blog hoping to stay connected. ive been waiting for you to wear this as a dress! and its stunning as a cardi like you’ve worn in the past. this print is just gorgeous. ahhh, I love me a good dress, this one is so pretty on you!! Um, you look gorgeous. Love this dress. I have it in brown. Very cute! Love how pretty and easy this look is! Have a lovely day! Is that a wrap dress? I LOVE wrap dresses. They are my new obsession just because they are so easy to style! And comfortable. This dress is so pretty! I actually thought it was a romper at first. Love that dress. The print is a very subdued floral…really beautiful. This is such a perfect summer casual dress. Love the floral print. You look great, Jen! Love the floral dress! I totally agree…a dress is definitely more put together than t-shirt and jeans or shorts. 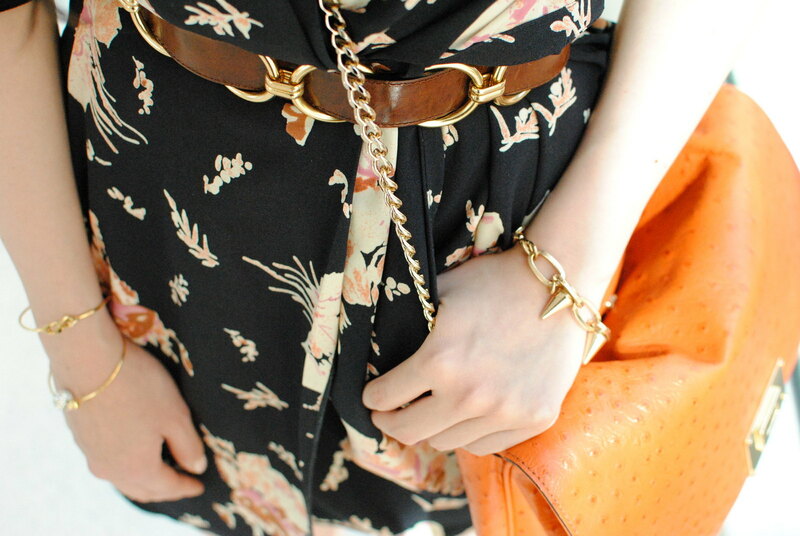 That belt & bag with that dress – LOVE! cute look! love your dress and your purse! This is so cute! I love the belt and the orange bag too! Super-cute outfit! I also love dresses for shopping. It’s so much easier in the dressing room! I love how you’re paired the belt with the Aritzia dress. You always look so adorable and happy! So cute, miss Jen! I love a simple dress & flats for summer! And your hair is looking oh so pretty here! xo!